If you’ve used a computer in the last 20 years, you are surely familiar with the JPEG file format. It is the preeminent and, most likely, the most commonly used image format in personal computing today. Note that in some cases, the file format extension is denoted as JPG rather than JPEG, but it all refers to the same format. JPEG was first developed in 1986 and has proved to be an ideal for many applications, even some 30 years later. Much of the success of the JPEG format can be chalked up to its versatility. It has the ability to be used in a variety of manners, across all devices and operating systems. Here are some of the major benefits of using the format. It offers lossy compression. What this means, in simple terms, is that it can compress large image files down to smaller file sizes by compressing the image and lowering the quality of it. These smaller file sizes make the images more practical, and quicker, to use in a variety of ways – sharing images, posting them on websites, or saving them to your computer. That being said, JPEG strikes a nice balance between quality and usability. Generally, files are higher quality and able to display a greater variety of colours than formats like bitmap or GIF; but they also maintain a smaller file size than an image format such as TIFF. The higher the quality of your outputted file, the higher the file size, but in many applications (such as web graphics), a lower quality file will be indistinguishable to the naked eye while taking less time to load for the user. The format is so widely-used that it’s likely to remain a standard file format for generations to come, even as devices change and technology continues to advance. Your reasons for converting a file to JPEG could be varied and as mentioned, there is no shortage of file conversion products out there. Here are some common motivations for doing so with two of the file formats that are highly utilized in today’s corporate environment. PDF to JPEG: If you have PDF documents that you wish to share on your website, you’re certainly welcome to do so; in fact, here is a guide on optimizing your PDFs for SEO (search engine optimization.) However, if it’s not a multi-page document, a JPEG image may be a more user friendly solution. TIFF to JPEG: The TIFF file format has several advantages and is great for certain situations and applications. One of its main drawbacks, however, can be the size of the files. With JPEG, you can retain good image quality with much smaller file sizes, making them ideal for sharing through email, or on your company’s website, for example. There are a variety of options for JPEG conversion, ranging from options that are ideal for single users at home to enterprise document conversion solutions that are geared towards large organizations. Here’s a look at a few of the solutions available from PEERNET that can help you convert to JPEG. If you’re looking for something with some more customization features, and which is targeted towards individuals or organizations who have more of a regular need to for on-demand file conversion, consider making use of our Raster Image Printer. It is built as essentially a virtual printer, so that users can easily convert documents into JPEG, TIFF or PDF formats, in the same manner as printing a document. In addition to the ease-of-use that entails, Raster Image Printer is also highly versatile, as it is able to convert any printable Windows document into the formats mentioned above. The ability to create settings profiles – so you can use pre-specified conversion and output settings for your documents, or, specify them for each conversion. Compression settings: take control over the quality and file size of your outputted JPEG file in order to create files at the ideal intersection of file quality and file size, for your needs. Full control of page and image processing, including: auto-rotation, cropping, brightness, margins, and image resolution, and others. Many more features for advanced users. Raster Image Printer offers the ideal combination between ease-of-use, features, and price. The ability to work with popular formats PDF and TIFF in addition to JPEG make it a popular file conversion solution. For larger-scale enterprise level organizations with a need for ongoing file conversion, Document Conversion Service is an industry-leading option. It offers conversion to JPEG in addition to conversion to PDF, TIFF and other vital, commonly-used formats in larger organizations, or those that deal with a lot of digital documentation. Document Conversion Service offers a robust feature set that makes it well-suited for companies that require an automated, batch file conversion solution. It allows organizations to constantly convert files in the background, 24/7 – operating as a true Windows service. As with Raster Image Printer, there are a great deal of document/file customization options available to the user. DCS is capable of handling not only common and general filetypes such as Excel files, Word files, and Outlook, but also more industry-specific types – offering support for specialized formats like postscript file conversion, AutoCAD conversion and Design Review Drawing conversions, among others. It allows advanced functionality for IT departments and power users, such as workflow integration for enterprise organizations, command line tools, and an unmatched scalability in the marketplace. Consistent conversion, so you know exactly what you’re getting in an outputted file. Ease of use, combined with powerful features, so that basic users can do what they need to, and advanced users can take total control over their files. Support for a wide range of file conversion types. The professionalism of knowing that your converted files will come out looking great, each and every time, with no watermarks or other extraneous visual elements. The security of making use of one common platform/software solution for your file conversions. Ongoing assistance, technical support and a wide range of how-to guides and FAQs if your particular questions are out of the ordinary. 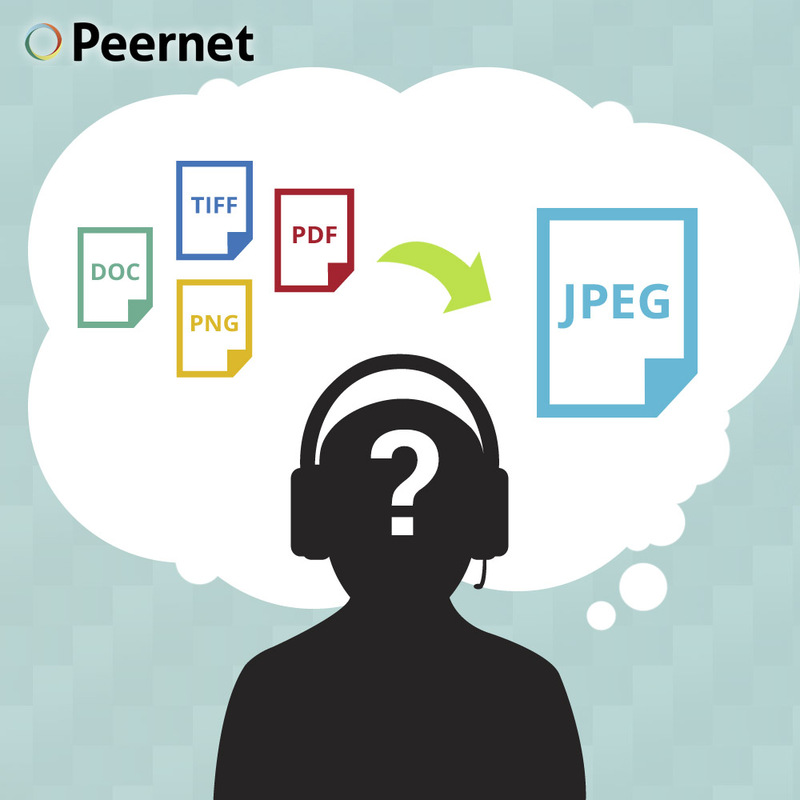 In the event that you need to convert files from JPEG, into other formats, PEERNET has you covered there as well. Click on the individual conversion to see a listing of the best options for your requirements. If you still need a helping hand, feel free to reach out and contact us. Our friendly and knowledgeable team will be more than happy to point you towards the solution you need. 10 Big Advantages of Using Professional File Conversion Software in Your Or... PDF or TIFF – Which One is Better for Your Company?